A summer spent at the Regenstein Fruit & Vegetable Garden is full of little joys and big surprises. Interning at Windy City Harvest, we (Lesley and Rachel) started our time with grand plans to become farmers, urban agriculture pioneers, business owners, and horticulturists. 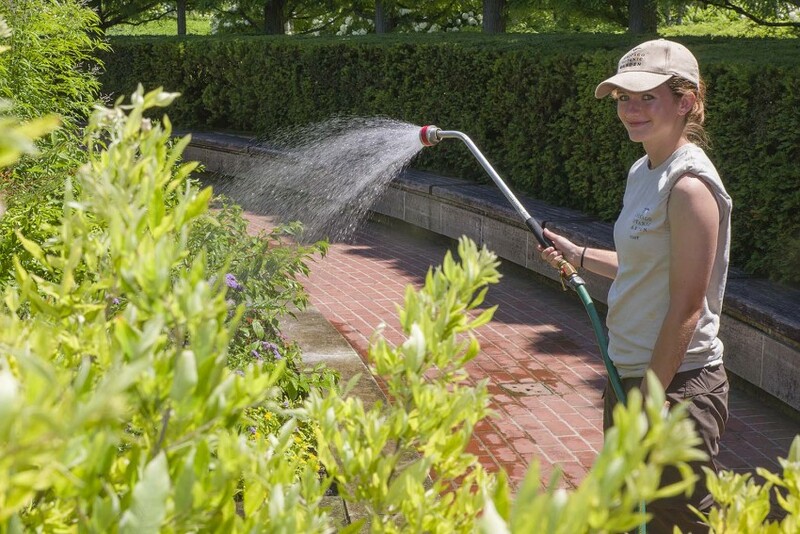 We thought a summer at the parent organization—the Chicago Botanic Garden—learning about a vast collection of fruit and vegetable plant varieties would be a good way to jump-start our careers in the field. But the weather and the Garden had a much different education for us in mind. The summer’s weather has been very cool and wet: this is not ideal for some of the fruiting crops that most people prize. Cucumbers and squash are everywhere and right on schedule, but the bright red, heavy tomatoes we love to harvest this time of year are taking a bit longer to ripen in the cooler weather. And yet, the cooler weather has brought visitors to the Garden in friendly droves. These visitors (avid gardeners, young children, families, and globetrotters) have encouraged us to keep the garden in good shape throughout the season, and shared their own sense of wonder about fruits and vegetables. 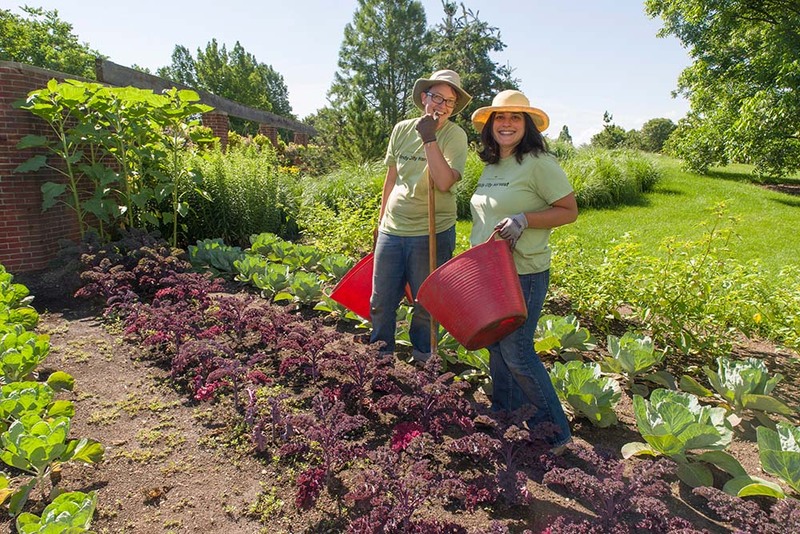 Although the Chicago Botanic Garden has a separate garden—the Grunsfeld Children’s Growing Garden—dedicated to working with children, many families bring their children to visit the Fruit & Vegetable Garden while they are here because of the broad range of fruit and vegetables we have on display. They can also learn about bees or growing watermelons. They may even spot toads here and there, if they have a quick eye. Can you identify this gorgeous bloom? Its tubers are a staple food crop. Both of us have enjoyed showing children how carrots and potatoes grow, since those plants, specifically, look very different when they are growing than when they are on a plate. Getting the chance to talk to children about food and farming has affirmed our commitment to the work that lies ahead. Sharing our knowledge about growing healthy, sustainable food is one of the most important skills that we can develop as future farmers. One warm July day, a group of 7- and 8-year-olds walked into the garden, where we happened to be cultivating “the three sisters” (corn, beans, and squash). They stopped in their tracks, entranced by the long ears of corn. “Do you know where popcorn comes from?” Rachel asked. The curious kids looked at one another, shrugged, and all eyes turned to the apprentice farmer. She asked the children to look around and spot the plant that might be responsible for the delicious snack. Suddenly, it dawned on a few of them, and they jumped and pointed, “It’s the corn! It’s the corn!” The corn plants took on a new significance when we were able to put them into context. The discovery of how favorite foods grow brings delight in the garden. The diversity of plant life in the Fruit & Vegetable Garden attracts some of the most inquisitive, passionate, and skilled gardeners from around the globe. Patrons are constantly asking us questions about plant varieties, weather patterns, soil amendments, and why our eggplants don’t look like their eggplants. They want to know what cardoons taste like, or where we sell the gigantic Zephyr squash. 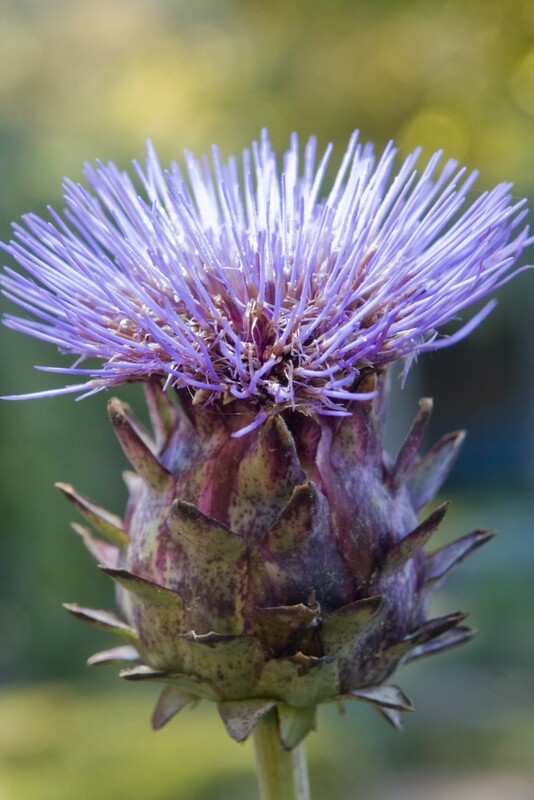 A highlight of the vast collection displayed at the Fruit & Vegetable Garden, the cardoon. Is it a thistle or an artichoke? A little bit of both—and edible! On a particularly lovely early morning, a couple from England pulled us aside and shared what they’ve been growing in their allotment garden across the pond. They were inspired by the fruits and vegetables they saw in the garden and wanted to share and compare notes about their own bounty at home. “Have you ever made beetroot chutney?” they inquired. We looked at each other and shook our heads, but we wanted to know more. We had never heard of the recipe but were certainly intrigued by the sound of it. The couple explained that it was a savory dish consisting of sautéed beets, onions, herbs, and vinegar—lovely as a condiment or side dish. We were both inspired to call beets “beetroot” and make beetroot chutney after that conversation. Herein lies one of the greatest gifts of our internship: we have been able to learn from experts, share knowledge with visitors, and get a lot of hands-on experience. We thought we might have a difficult time adjusting to the early morning hours and manual labor, but the joy we have experienced has definitely made it worthwhile. Our paths have crossed with so many interesting and amazing people—all in the name of fruits and vegetables. Both of us are former educators who value the gifts of teaching and learning. Our previous classrooms had four walls that bound us to a specific space. We continue to teach and to learn. 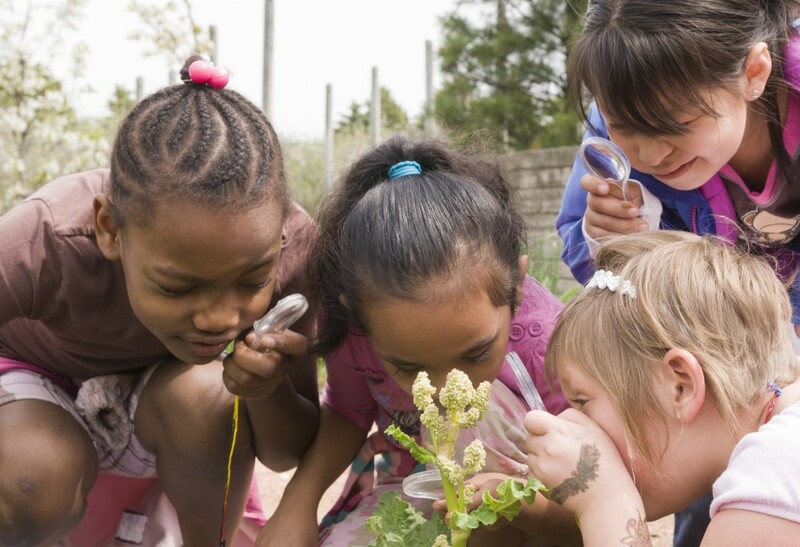 But our classroom looks a little different—no walls, open space, tons of possibilities—the Garden. There is much knowledge to share about growing fruits and vegetables—for experienced pros and newcomers alike. 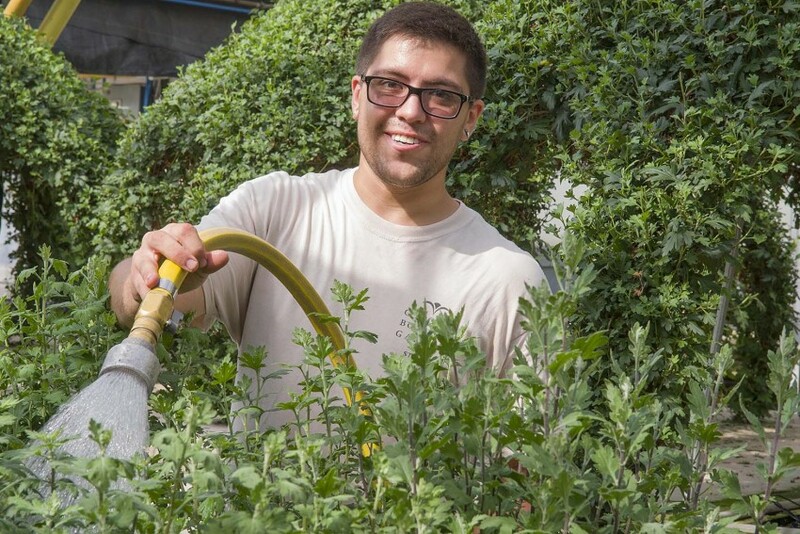 These experiences are not only for Windy City Harvest interns. Hop on your bike, take a walk, and plan a visit to the Chicago Botanic Garden or your local farm and talk to your gardener! The secret is out; visitors to the Chicago Botanic Garden have unprecedented access to plant information, guides, and tours through a groundbreaking smartphone app, called GardenGuide, launched last year. Garden staff and volunteers used their skills and savvy to squeeze interactive maps, audio guides, points of interest, and botanic details on more than 10,000 plants into an application that sits in the palm of your hand. How did they do it, and what keeps the wheels turning? The ability to access this information in real time during a Garden visit is what makes the app so special, according to Boyce Tankersley, the Garden’s director of living plant documentation. 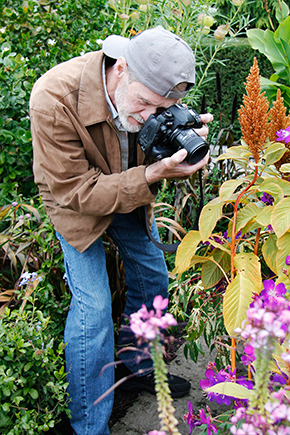 He said that people “look down at the app, they see what they need to see, and then they are back to experiencing the Garden, just as we had hoped.” In addition, photos and plant information are frequently being added, so there is always something new to discover. 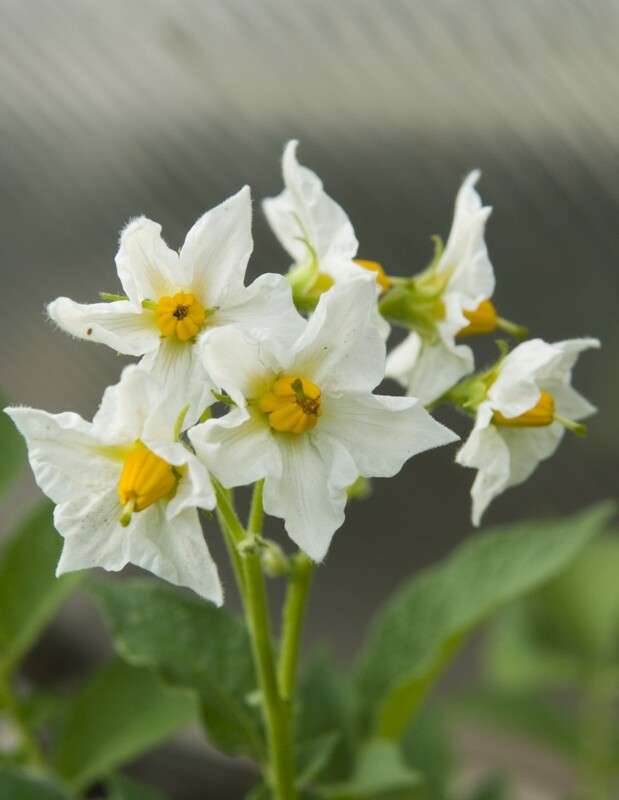 Before new data and photos were added to the plant collections database, Tankersley and his team upgraded their long-time plant collection’s database to include 37 new information fields that would work well with the app, from soil type to bloom time to sun requirements. Many of the fields were added as check boxes, to make them easier to sort through with the app. It was then that he recruited another 80 volunteers to help gather and enter all of that new information. As the project progressed, a new team of highly specialized volunteers came together to help build the data that is shared via the app. A group of 20 volunteer photographers captured digital images to accompany each species listed, under the direction of their team leader, Dorothy Peck. A group of 12 volunteers, led by team leader Glenn Kohlmeyer, scanned plant information slides researched by Richard Hawke, the Garden’s plant evaluation manager. 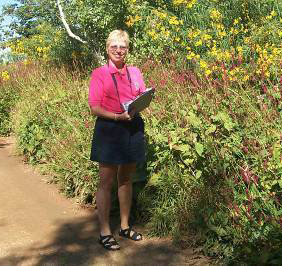 Under Tankerley’s watchful eye, another 20 volunteers researched and input key facts about the plants. 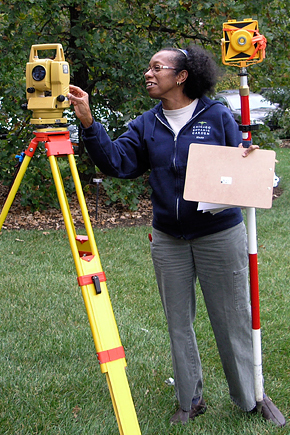 Perhaps furthest under the radar, was the smallest group of volunteers who handled the intricacies of GIS mapping with guidance from Veronica Harry-Jackson, a Garden GIS specialist. “We wouldn’t be able to pull off a project like this without a lot of dedicated staff and volunteers,” said Tankersley. The process to create the app began more than two years ago, when project manager Cheri Van Deraa, the Garden’s director of online marketing, assembled a team including representatives from different areas within the Garden. She led the initial step of researching similar products on the market and incorporating possible features. 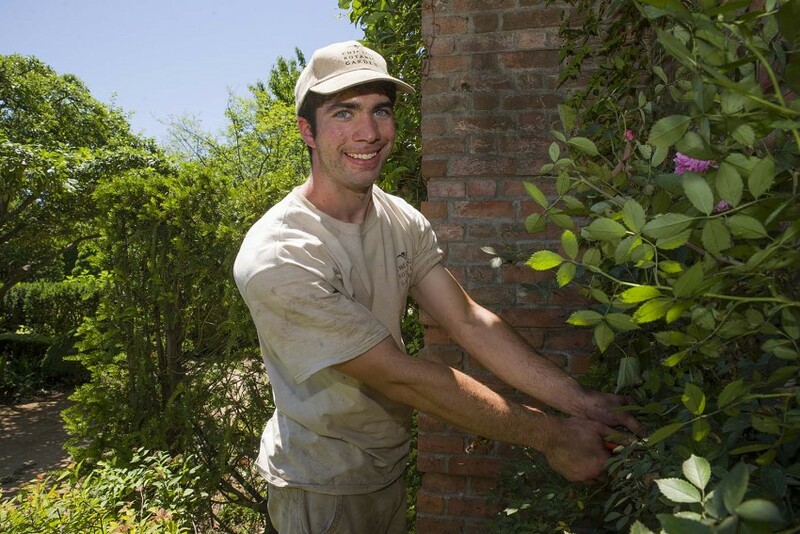 The list began with the Garden’s plant collections, and grew from there. The planning team considered a growing list of needs that visitors have when they come to the Garden, and included functions to address them. “The visitor needs we documented over time are now being met in this app,” said Tankersley. “The basis of the app was the plant collections database, but we realized that people like to find other things at the Garden, so we created a new second database for the app. It has points of interest at the Garden, like water fountains, classrooms, sculpture, the location of the Japanese Garden, and more,” said Van Deraa. Once the two databases were polished, they were worked into the architecture and mapping system for the app software. For those who are not sure what to look for, there is a feature called What’s in Bloom Highlights. The feature highlights plants in bloom twice each week, with a map that shows the visitor how to walk to them. Additional functions that were built in include audio tours, walking tours, and Van Deraa’s, favorite—maps leading to ‘secret spots’ such as the quiet bench atop the Waterfall Garden where birds visit early in the morning. “The GardenGuide app was designed to deepen the visitor experience with the Garden,” said Van Deraa. GardenGuide has been in use for nearly a year now, and updates are ongoing. In 2014, the app was awarded a Gold Trumpet by the Publicity Club of Chicago for distinguished achievement. Not resting on her laurels, though, Van Deraa has been focused on updating the software necessary to work with a new Android operating system, KitKat, which is now complete. The next version of the GardenGuide 2.0 is in the works. Volunteers continue to take and add new photos, and research and input new pieces of information. “Because the Garden is constantly adding new plants to the collection, we are always adding new plants to the app,” said Tankersley. “In the long term, in effect this becomes a digital encyclopedia of plants.” Tankersley hopes to eventually add data on another 46,000 plants that have previously lived at the Garden and may one day return. Users of the GardenGuide app can be assured that the information in the app has been updated with care by a remarkable team of volunteers and professionals working together. It’s all there, in the palm of your hand, just waiting to be tapped. This project was made possible in part by the Institute of Museum and Library Services (grant #MA-04-11-0101-11).